You may have walked past Siempre Bicycle Café many times. It’s easily done. After all, at first glance it simply looks like a small coffee to-go window. Step up, order and be on your way. Fast, easy but unfortunately you’re totally missing out. Step through the door into the most magical little café. Actually, the most magical massive café. Siempre is a sprawling tardis of freshly made food and bicycle bits and bobs. As the name suggest, you can indeed get bike gear, clothing and even bikes. Or you can sit down in one of their comfy spaces and enjoy scrumptious food. We opt for the latter and are totally delighted by their scrambled egg and salmon on a toasted bagel, eclectic veggie platter and refreshing smoothies. The French toast is also tempting. 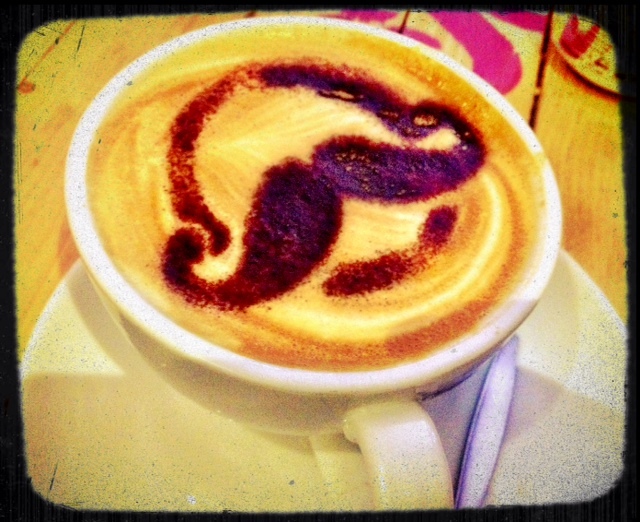 We’re totally charmed by their cuppas – that quite literally come with a smile…ok a moustache but still pretty cool. And their extensive selection of hot chocolate is nothings short of impressive. Whether you like it super sweet or even spicy, Siempre has it covered. Not only is does this relaxed haven offering up good food, the staff are also lovely. It’s the perfect place to whittle away a few hours. So the next time you’re speeding out of the Kelvinhall underground, by-pass that to-go window and treat yourself to something tasty inside. This entry was posted in Glasgow cafes and tagged #inglasgow, About a city - Glasgow, West End Glasgow, what to do in Glasgow. Bookmark the permalink.